If you have a mobile device such as a laptop, and wish to encrypt the whole computer we would recommend some free software called TrueCrypt. Microsoft has its own version of encryption software called bitlocker, however this is only available on Windows 7 Ultimate/N editions, and as most computer stores ship with Windows 7 Home Premium, this is not an option. Windows 7 can be encrypted with TrueCrypt very easily, and at no cost to you. TrueCrypt operates in a variety of ways, however for this blog we will focus on pre-boot Operating System encryption for the storage device i.e harddrive, so that a password is required to access the data once the computer is turned on, and prior to it booting into Windows. It is possible to encrypt a single file or partition with TrueCrypt in Windows, however the below guide focuses on encrypting the whole physical disk from bootup. 1. Download TrueCrypt for free at truecrypt.org (64bit and 32bit versions of Windows 7 are supported). 2. Launch the setup Wizard, except the terms and conditions and press Install. 3. Leave all options default and TrueCrypt will create all the necessary desktop icons, and file associations. TrueCrypt will also create a restore point for you to roll-back with in the event of any problems when installing the software. 4. After the install completes, launch the TrueCrypt blue icon from the desktop. From the top menu, select System > Encrypt System Partition/Drive. 5. Read both options on the screen and either select Normal or Hidden. We will select Normal for this guide. On the next screen select if you wish to encrypt only the Windows partition or the whole drive. In this example we will encrypt just the Windows partition. Remember that if you have multiple partitions with sensitive data on them on one single drive, you should select the whole drive option. 6. Select the option that corresponds to your setup, on this occasion we are focusing on encrypting a single operating system, so we will select the Single-Boot option. 7. By default TrueCrypt offers us AES (Advanced Encryption Standard) which is sufficient for the average person. Note that if you select a more complex encryption method, such as Serpent, Twofish & AES then performance will be negatively affected. 8. On the next screen, enter your decryption password, this is very important, do not forget it! You will be prompted for it each time you turn your computer on to decrypt the Windows partition. 9. 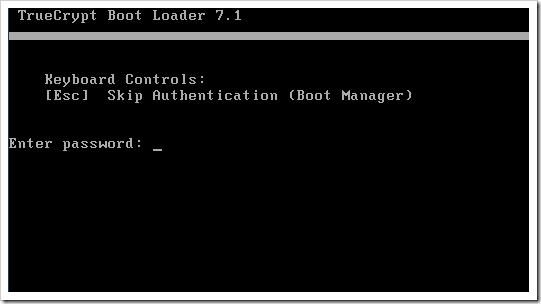 After passing the next steps by moving the computer Mouse, generating the keys and creating a rescue disk (you will need a blank CD) you are ready to encrypt the Windows 7 partition. 10. Complete the process of encrypting your system by pressing next. This can take some time, so be patient. Once you next reboot, you will be prompted with a password to access Windows. See image below. Congratulations, you now have Windows 7 encryption for free!